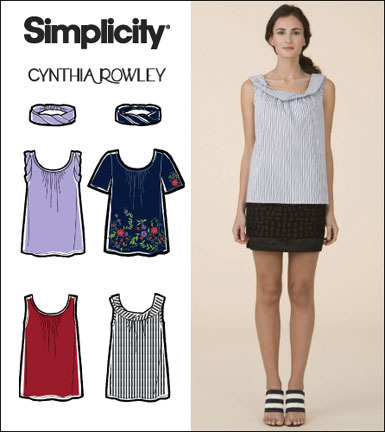 Simplicity 2593...a review (and a winner of Bari J's book!) - Stop staring and start sewing! The winner of Bari J's Inspired To Sew book is Jessica! Congratulations to Jessica! I've spent the past two days working on this Simplicity 2593 pattern. 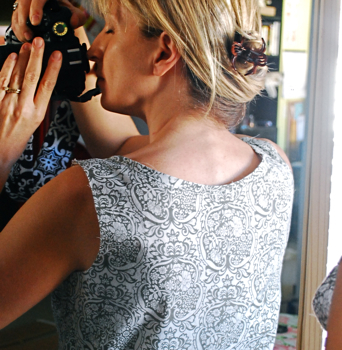 It's from designer Cythia Rowley and could be the perfect Arizona blouse. I picked up this sweet, very lightweight (but not see-through) fabric at my favorite cheapo fabric store. It was 2.99 yd (and 50 inches wide). It's cotton and has the same weight as a voile but is not as silky as a voile (but still very nice). According to my measurements I should be a perfect size 14 with Simplicity patterns but after constantly writing "use next size down next time" on my patterns I decided to just dive into the size 12 and cut my pattern out using that size. I put the front and back pieces together and then attached the binding at the neck. I was not happy with the gapping in the back. It caused the shoulders to hang off on the side and the front to droop. (I was going to photoshop that red mark off my neck but realized this would be a good time to make a PSA...Caution: Curling Irons are Hot). I took in the gap on the pattern by folding under 1" on the back fold line at the top and tapering it out so there was no change at the bottom of the pattern piece. This ended up taking it in 2" on the back neck center part of the blouse (making in narrower at the top but the same at the bottom). I had enough extra fabric to cut a new back piece so I took out the binding along the back and removed the original back piece. Here you can see the new back fit is a lot snugger (but not tight). 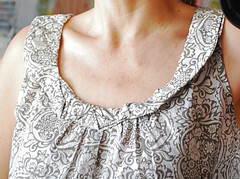 It also brought the shoulders in enough to fit nicely without slippping from side to side. Nice. 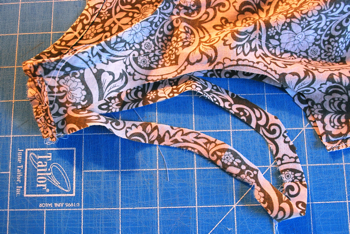 When the armhold binding instructions began the first sentence was: Trim away 5/8" from armhole edge of garment. No pictures, no nothing. Ugh. Why didn't they just remove the 5/8" from the pattern in the first place? It made me realize how much I depend on good pictures to get the point across. I thought about it and it dawned on me that this instruction only applied to the sleeveless versions (which is finished with binding) and the 5/8" was there for the sleeved version (as the seam allowance). But since I'll never make the sleeve version I'm just going to cut it off the pattern pieces now. I also checked as many reviews on this blouse as I could find and a lot of gals complained about the armhole being too tight (because they hadn't removed the 5/8" from it). Here's what it looked like while I was trimming it. I made View A with the twisted neckband and it took quite a bit of fiddling to get everything looking even. I pinned it like crazy before slip stitching it in place. I tacked down some of the loopiness since I didn't want it popping up. I also unfolded it at the shoulders and machine stitched the band to the blouse along the shoulder seam line (then folded the band back down so it'll never been seen). Here is the finished blouse and I really love it. It's comfortable, modest and uncomplicated (but the neckband makes it interesting). The next time I'm making it without the neckband and I'll be surprised if the whole thing takes more than an hour (it's just a front and back pieces plus binding for the neck and arms). This pattern is going to serve me well in the Arizona heat this year. I hope you're having a great week! It's almost Friday! !